Spy Camera USB Hidden Camera Wall Charger 1080P HD Mini Camera Security Nanny Cam with Motion Detection Alert, ideal for children and elderly security, home property, and self protection. Very simply and convenient to monitor your empty house or apartment while you're out to work or on vocation. 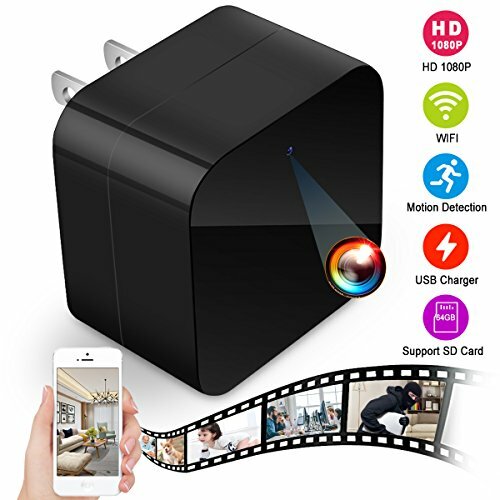 ✿BEST SPY CAMERA CHARGER WITH HD RESOLUTION: this mini spy camera wall charger records high quality 1080P HD video, and it can be used as an usb charger to charge IOS and android devices. ✿WIFI CONNECTION AND EASY TO USE: the setup APP HDMiniCam is easy to install on your phone(IOs/Android), you can view online video from anywhere on your smart phone with Internet access. Even through no Internet access, you can insert the micro SD card into the mini hidden camera, this usb hidden camera wifi spy camera can also record automatically. When you want to playback video from SD card in APP, just need to connect WiFi. ✿BEST HIDDEN CAMERA WITH MOTION DETECTION FUNCTION: the motion detection of this usb hidden spy camera will be activated and snapshots, then push notifications to your smart phones and make you alert when movement is detected. The motion detection video can be recorded to micro SD card after you set it in APP. This mini hidden spy camera supports micro SD card up to 64GB(not included). ✿SUPPORT MULTIPLE DEVICES AT THE SAME TIME ONLINE VIEW: one mobile device can connect many mini spy cameras and one wireless hidden camera allows to connect 8 smart phones or tablets. This wireless hidden camera can work on android and IOs devices,PC,MAC and other devices(not for windows phones).